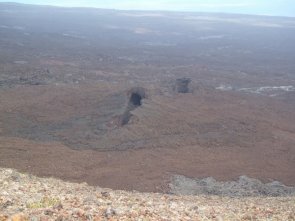 Volcan Chico is an hours walk from Sierra Negra, along a trail laid across the seemingly alien landscape. We came across the most unlikely signs of life in the desolation. 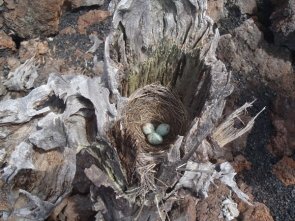 Mostly it was just the odd ferns and cactuses that grew here, but our guide showed us this mocking bird nest in a dead cactus trunk. He had seen the bird gathering materials for the nest and so knew where it was hidden. 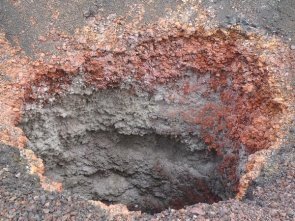 Along the route were brightly colored chasms, formed by bubbles in the lava that subsequently collapsed. 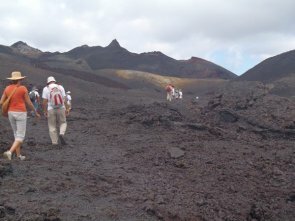 Finally at the top of Chico, we could see the lava flow all the way down to the sea. On the way back our guide pointed out this Darwin daisy. 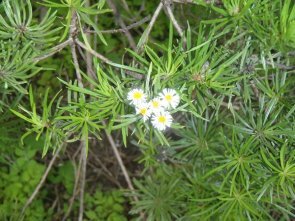 Once threatened with extinction due to being eaten by the feral goats, the goats are now being controlled and the daisies are growing again.